Many say that giving is better than receiving. It is reported that America is the most giving country when a disaster strikes or a when a need exists anywhere around the globe. During the Christmas season, we shop till we drop, buying gifts for loved ones. Giving comes from the heart. We love to give. It’s a good thing. If our giving alleviates troubles, lightens hearts, of just brings a smile to someones face, we feel great. But what do we give God? This is His birthday celebration after all. Christmas would not exist as a holiday if not for the birth of Christ. Though many would like to consider Christmas a “secular” holiday, you can’t. Sorry. Doesn’t work like that. One can secularize Christmas in their heart, stripping any thoughts of the celebration of our Savior’s birth…but that doesn’t cease to make December 25th a religious “holy-day” any more than declaring that the Fourth of July is not about celebrating, in the spirit of freedom, our country’s independence. …what ARE we giving to God this Christmas? That begs the question, what does God want? After all, He has everything. He says, “for every animal of the forest is mine, and the cattle on a thousand hills.” Psalm 50:10 (NIV). But…there must be one small gift we can offer the Lord on His birthday. Those verses speak about our tithe and how we should give it, but let’s look further…what does God really want from us? God wants our hearts! Whew! But maybe that’s a big thing, a tough thing to give. Maybe it’s too hard to consider giving our guarded hearts to God. Maybe we feel let down by God in the past, hurt, wounded. Maybe our hearts are just to fragile to give away…what if they break…what if God doesn’t love us? Take a look at the manger scene and from there raise your eyes to the cross. God does love us. He gave His son for us, born as a baby from a virgin. Mary said yes to Angel Gabriel and by the power of the Holy Spirit, The Word Made Flesh and dwelt among us. God offered His Son as a Sacrifice for our Sin. He does love us. This Christmas, let’s consider one specific offering…even a small one, from our hearts. Not sure what to give, specifically? Pray. Ask Him. Seek Him and what He would like from you for Christmas. It can be anything, even giving up a bad habit, or beginning a new practice that honors Him, or whatever you feel God would like as a gift from you…maybe even taking a small step toward giving your whole heart to Him. He does promise that by doing so, we will “delight” in His ways. Sometimes, even showing up is a gift, the beginning of giving God what He truly wants from us–our hearts. So this Christmas, show up in His Holy Temple, in His Church and kneel before His Presence and lay down your gift at the Altar. At St. James Anglican Church, we celebrate Christmas with Lesson and Carols at 10:30 pm and then we have the celebration of the Christ Mass at midnight. I pray that many will come..and lay their gifts before The King. Pretty Simple. We need God. Once we recognize that truth and seek Him, we will find Him. And what joy when that happens. Seek Him this Christmas. Love this psalm and this amazing video done acapella. Christian Fiction Friday is a weekly blog hop where authors post snippets from their current works in progress. It is hosted by Alana Terry and Hallee Bridgeman. See below for a full list of rules and suggestions. This week, I’m joining in the fun! Swirls of distant smoke, like incense, sent the dead up to God. On the outskirts of the remote Nagapattinam fishing village, Rebecca leaned against the Jeep. 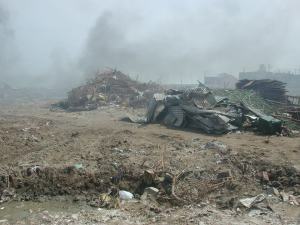 Two weeks after the tsunami and piles of burning bodies still smoldered. Her heart sunk thinking about the thousands who lost their lives and the pain of their survivors. India had captured her heart since she was a child, but this wasn’t the India she’d imagined. Her gaze fell from the sky above the thatched roofs to the activity across the sandy road. Kumari, a beautiful woman dressed in a saffron and red salwaar kameez, stood near a shirtless, dark-skinned man. He raised his machete then sliced it sideways with a swift whooshack. Kumari accepted the scalped coconuts from the man. She stepped around a cow then approached a tall man corralling Indian youth workers onto a small, blue bus with “Praise the Lord” painted across the top of the windshield. As soon as all were loaded, the Lord Jesus bus would follow Father Michael’s Lord Ganesha Jeep back to the orphanage. So far, every Indian vehicle Rebecca stepped in had hailed its religious affiliation—from auto rickshaws with rosaries dangling from rearview mirrors, to tiny fat Buddhas tucked in the corner of the windshields, to dashboard displays of blue, multi-armed, and elephant-faced beings. Hints of spices and frying oil drifted from the tiny teashop across the road, where the coconut vendor had parked his cart. India poured out intoxicating mixtures of sights, smells, and sounds and in spite of the tragedy, Rebecca drank it all in. The sun dipped below the top of coconut trees. In a few hours, in White Gull Bay, morning rays would slice through the bare maple tree outside the Wisconsin farmhouse window where her ten-year-old daughter slept, the same bedroom Rebecca once shared with her sister, and dreamt of India. Kumari finished her conversation with the man, then crossed the ragged strip of a road toward Rebecca. It didn’t occur to me at the edge of the pond that I’d broken the sixth commandment, actually committed murder. I was busy working out a deal with God, swearing to Jesus I’d become a nun if He helped me breathe life back into my baby sister’s limp body. At the time, it didn’t matter that I wasn’t Catholic. Now, a week after the funeral, Mama set me straight while flipping pancakes in the kitchen. “Daddy blames you for Kara’s death.” She said it like I’d let the milk spoil because I hadn’t put it back in the fridge, but the weight of her words cemented my bare feet to the green linoleum. She reached for a platter and set it under the open window. The morning sun highlighted old stains, batter spills, and cracks on the brown laminate countertop. A cool morning draft rustled the faded yellow gingham curtains. Mama got a deal on that material from Woolworths before Kara was born. Along with curtains, she sewed four sundresses for each of my sisters and me. It wasn’t fair that the fabric was still with us, fluttering over the sink, yet Kara came and went as quickly as the wind. Mama transferred pancakes to the plate. My plan to breeze through the kitchen and escape the house unnoticed should have succeeded because for a week, I’d been a ghost. None of the people in the house—my parents or any of my brothers and sisters—spoke to me. I’d lived a cloistered existence with my blue notebook and unsettling thoughts. Now, I only wanted to sit under the maple, read the Kara stories, and wind back time. I tightened my arms around the notebook, holding it to my heart like a talisman, as if my words of love for my sister could erase the raw sting of truth in Mama’s words. Since that day at the pond, I’d been carrying that notebook everywhere, even sleeping with it. In my lake of sadness, in my whirling murky thoughts, those sacred pages had become my life preserver. Mama snapped the griddle nob off and faced me. “We left her with you that morning. She was only seven.” Her words rushed out in a seething whisper. My shoulders fell and hope slid from them and disappeared out the kitchen window. Only a month ago in my white cotton confirmation dress, I citied the Ten Commandments and professed my faith at St. Andrew’s Lutheran Church. So confident. So holy. Mama baked a cake. Writers, want to join the fiction fun? Hop over to Hallee’s Blog! Click here for a full list of rules and suggestions. First newsletter…and guess what? Some BIG news! Just published my very first Mail Chimp newsletter. Huge challenge for my non-techy-hate-learning-new-stuff-brain, but I got ‘er done! Still trying to figure out how to add a sign-up form on my blog and website, but, for now and for those who haven’t signed up for my newsletter, here’s my exciting news in old school cut and paste method from the newsletter (and a link below to get future issues of the real thing). First, the banner of the newsletter. It doesn’t have a fancy newsletter name, but oh well. My husband spoke those words nearly ten years ago when we landed in South India, just days after the 2004 tsunami. He had once lived and worked in the region and knew of the fisher-folk’s living conditions and the havoc a gigantic wave could wreak on a village with homes built of sticks and coconut-thatched roofs. I mentally geared up for mission work, but had no idea how difficult, yet fulfilling, the experience would prove to be. 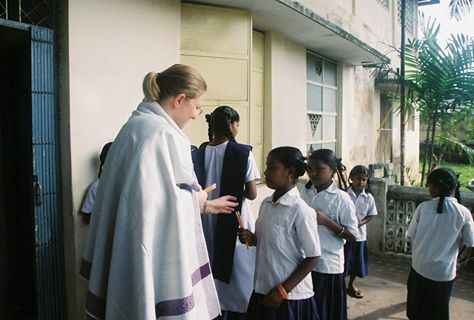 Now, ten years later, we are preparing to leave for South India for a follow-up visit to the places and people helped from the generosity of America, after a 2004 major fundraising event. (I gotta pack soon). Funds were used to help rebuild the villages and to provide many orphans with local bank CD’s (to mature in ten years). Now, the children are ready to collect their money and begin their adult lives. I’m so excited to go back and meet these young people and write their stories. I’ll compile a “then and now” short book (with photos) and release it on the anniversary of the tsunami: December 26, 2014. (Tsunami 2004: Then and Now. Devastation from the Sea. Help from Beyond. – Working Title). Though both Crooked Lines and the sequel include experiences in the Nagapattinam seaside villages and some life experiences of mine and my husbands, both are works of fiction. Release date for the sequel is planned for February 2015, hopefully Valentines Day. Here’s the first paragraph of the sequel to Crooked Lines. (Crossed Lines-working title…do you like that title? Let me know in the comments. ): Like swirls of smoke from incense, smoldering heaps sent the remains of the dead up to God. I turned away from the distant piles of burning bodies. 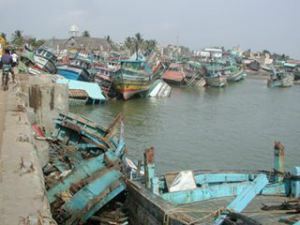 Nagapattinam, two weeks after the tsunami, wasn’t the India I’d been imagining for the past twenty years. Yet, every storm that swept into my life since I was a teenager had prepared me for this time and place. And in case you haven’t gotten Crooked Lines (reached #1 spot in inspirational fiction on Amazon) here’s the back-cover blurb: On the shores of Lake Michigan, Rebecca Meyer seeks escape. Guilt-ridden over her little sister’s death, she sets her heart on India, a symbol of peace. Across the ocean in South India, Sagai Raj leaves his tranquil hill station home and impoverished family to answer a higher calling. Pushing through diverse cultural and religious milieus, he labors toward his goals, while wrong turns and bad choices block Rebecca from hers. Traveling similar paths and bridged across oceans through a priest, the two desire peace and their divine destiny. But vows and blind obedience at all costs must be weighed…and buried memories, unearthed. So…for occasional brief and newsy updates about book release dates, sales, etc., here’s the link to sign up for my newsletter: CLICK HERE. Why not? Hi, my name is Connie Almony and I am a creative problem solver. If you give me a problem that should be solved, I will shake inside until it is. That’s just how my brain works, and THAT’s why I created the Indie Christian Fiction Search site—Ickfuss (ICFS) to its friends. I saw a problem and I had to solve it. What was the problem, you ask? Well, there were a few. 1) Avid readers needed to find loads of books that would feed their insatiable need and target their interests, all without breaking the bank. 2) Christian readers needed to find a greater breadth of story, not often available through traditionally published books, while being within a biblical framework. 3) Christian readers needed extra information—that which is often missing from online retailers—before making the decision to buy. 4) Readers needed a way to search through lots of material that is easy, non-cumbersome and directs them right to books that interest them through search criteria and scrolling mechanisms that allow the reader to sift quickly through blurb excerpts. Why were these my problems to solve? Well, because I knew it could be done, and yet no one was doing it. Why focus on indie fiction, you ask? … (Sigh) … My, but you’re an inquisitive group! I haven’t always been an ardent supporter of indie fiction. I believe an author is well served when many eyes see her work before it is published. I also believe any product is best when it is formed by a group of people using their unique gifts (ie. The Body of Christ). So Indie always looked like someone who just didn’t want to play by the rules. (God often humbles me when I get too opinionated). I worried the work would suffer for it. But then the new era of indie publishing steam-rolled into being. A world of critique partners, beta readers, freelance editors and cover artists, Facebook writers’ groups, search engines and social media platforms. Not to mention the low cost (I mean, how much lower than $0 can you get) of uploading your ebook to an online retailer. All these factors increased the ability to create a better quality book with a smaller investment. The game has changed, and so has the breadth and quality of fiction. I didn’t mean to be an indie author myself. I sort of got conned into it by my critique partner, Mildred Colvin, and discovered there is a world of fiction out there that is feeding a need not met by the traditional houses. I have found a plethora of Christian fiction which has been deemed unsellable by publishers for a variety of reasons, be they time period (medieval), character choices (Viking, pirate, multi-cultural), settings (universities, cities, space) or subject matter (mistresses, drug addiction), and discovered worlds like the one in which I live, replete with sinners in need of a Savior. Additionally, I discovered that many of my favorite authors, when given the chance to write from their hearts instead of a marketing team’s idea of what “the public” wants, are EVEN BETTER when writing this way. Yes, you read that right—EVEN BETTER. And as an avid reader, indie fiction is a lot less traumatic to my credit card. Quality of Writing or Marketing Guts? I’ll tell you what? Many are concerned that because indie authors have not been vetted by the process of acquiring an agent or catching the eye of an editor, their work is not as good. The truth is I STILL suggest authors go through this process and hone their craft, before making the jump. But there is a point where the author realizes it’s not the craft, but the perception of the general marketplace that is holding him back from publication. Yes, it is nice to have someone “important” like you, but just because that someone doesn’t like you, doesn’t mean the rest of the world must ignore you as well. Many novels are rejected because the theme of their work has not been tested in the marketplace. However, in these tough times of the publishing industry it is likely nothing new will be tested until someone has the guts to do so. Therefore, lots of extraordinary ideas fall by the wayside. With indie publishing the READER is the gatekeeper, not the executive, nor the marketing team—honest-to-goodness readers who have a love for the written word, and a great story, just like you do. Independent authors often offer early books cheap (and even free) so YOU, the reader, can get a sense of who they are and what they write. Then YOU can decide whether or not you want to continue reading them. It’s just a matter of finding this new breed of author. But there is another problem. 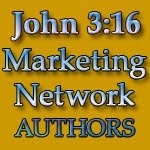 Traditional Christian publishing didn’t just vet for quality, it also vetted for biblical content. If you’ve ever gone “church shopping” in a very secular area (as I have) and you’ve seen the variety of agenda’s that come from groups that label themselves “Christian,” you will know not all people wearing that moniker promote the same sort of faith. In fact, in one of our independent author Facebook discussions, one of our members found a “Christian” group writing very decadent—and painful—forms of erotica. In these gate-keeper-less times, someone needs to step up and help us wade through the muck. Indie Christian Fiction Search (ICFS) is designed, asking the author to ensure a level of standard outlined in its Statement of Faith and Content guidelines, while informing the reader so he or she can make a decision as to whether or not the book is right for them. I also hope readers will return to ICFS to comment on books they found either exceptionally inspiring or not quite their cup of tea—respectfully, of course. Again, the reader is King here! So now readers will have access to information on a larger breadth of biblically-centered fiction in one place. The next trick is how to search through all the titles to find the one for you. I had a vision from God. Or at least, my mind kept playing images of an old template I’d used for my blog and the many “views” it allowed that would make a quick search of a large amount of material very easy. So I decided to try it out by posting a bunch of friends’ books to the site. I’d been pondering how to do this because, frankly, I find most book retailer sites cumbersome and less fine-tuned to my needs, requiring lots of clicks into things I eventually have no use for. The largest online book retailer comes close, but does not allow for a page full of blurbs under search criteria ready to be scanned. It only gives a page of book titles, cover art and price. 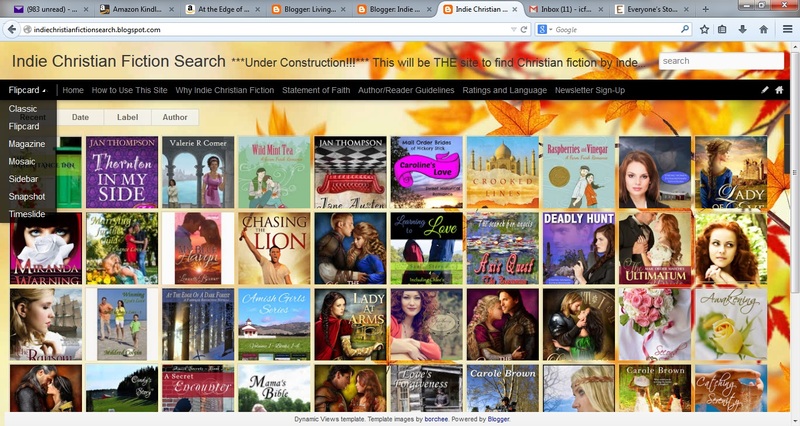 With Indie Christian Fiction Search (ICFS), you can plug in search criteria and watch the cover art float across the page. Then you can change the “view” of the site and scroll through book blurbs selected by genre or search criteria and pick through the ones that look good to you. There are a number of ways to do this. It’s just a matter of finding the one view that works best for you. So if you are an independent Christian fiction author and would like to have your novel listed on Indie Christian Fiction Search (ICFS), please enter the site, read through the Statement of Faith and Author Guidelines, and if it’s a good fit—submit. Please review the guidelines each time, as they may change. I will be adjusting things to streamline the site’s functionality. If you are a READER, looking for something reasonably priced and potentially unique, please check out the “How to Use This Site” page and see how much fun a book search can be. Try out all the views and feel free to tell me what works best for you. Indie Christian Fiction Search (ICFS) will be growing vastly over the next few months so make sure you drop by again. There is also a newsletter you can sign up for that will include links to new titles, and hot-picks, keeping you regularly informed of the latest in indie Christian fiction. I promise, it will not be sent out more often than quarterly. 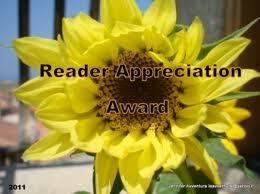 And don’t forget to come back and let us know what you think about the books you read. Remember, YOU are the gatekeeper. YOU have the power. Use it wisely ;o). Sign up for the newsletter NOW and be entered to win a $20 Amazon gift card. 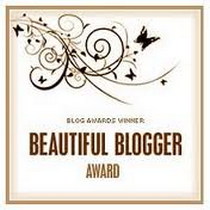 The winner will be announced on November 1, 2014. Connie Almony is trained as a mental health therapist and likes to mix a little fun with the serious stuff of life. 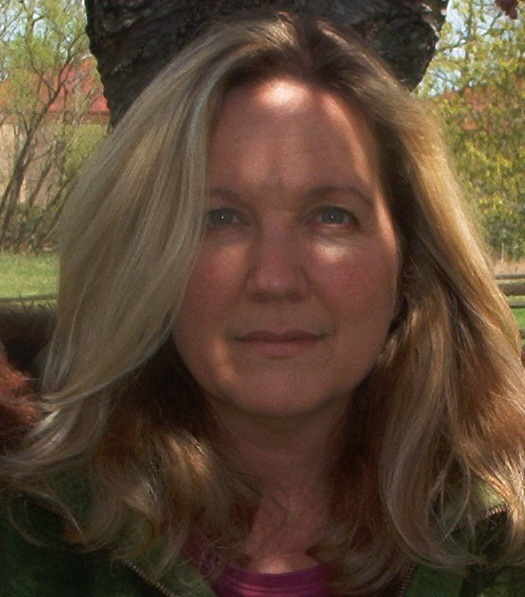 She was a 2012 semi-finalist in the Genesis Contest for Women’s Fiction and was awarded an Honorable Mention in the Winter 2012 WOW Flash Fiction Contest. Her newest release, At the Edge of a Dark Forest, is a modern-day re-telling of Beauty and the Beast about a war-vet, amputee struggling with PTSD. You can find Connie on the web at ConnieAlmony.com, writing book reviews for Jesus Freak Hideout, and hosting the following blogs: InfiniteCharacters.com, IndieChristianFictionSearch.Blogspot.com, and LivingtheBodyofChrist.Blogspot.com. I’m also blogging over at writingpromptsthoughtsideas.wordpress.com and was asked to write an article about Folklore. Here it is! 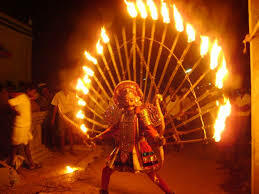 Religion and Moral Lessons in South India Folklore. Awesome Book Review and website! 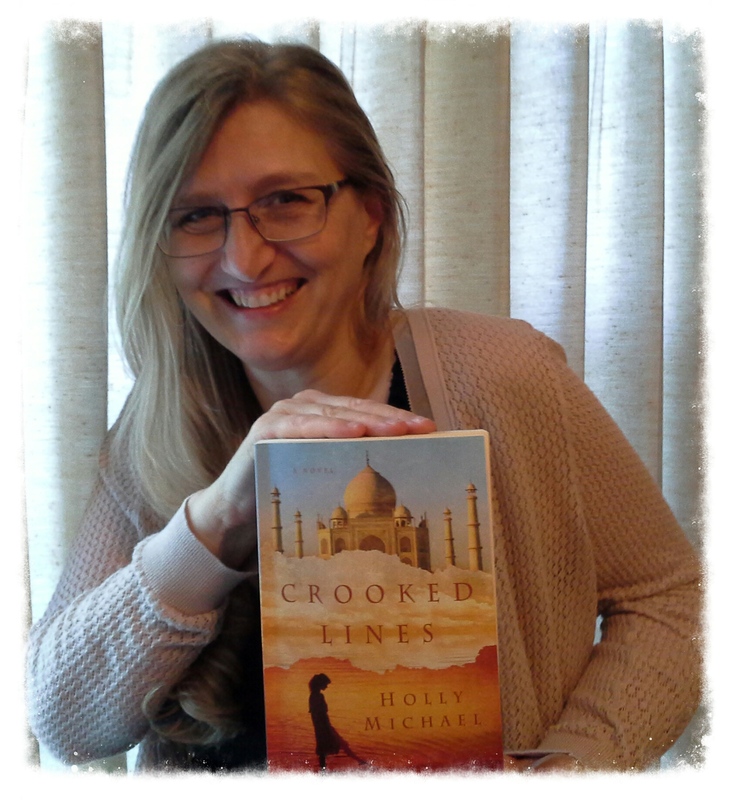 Crooked Lines #3 in an inspirational fiction category! Book Review: Crooked Lines by Holly Michael. Many authors have author Facebook pages, personal Facebook pages, but this morning I was invited to “like” a “Book Page.” Maybe it’s customary and I’m just not with it, but I hadn’t yet seen a Book Page for one specific book. Seems like a great idea because you can streamline information, updates, and chatting just about one specific book. I like the idea. 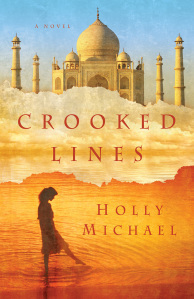 So…since I just launched my novel, Crooked Lines, I made a sweet Facebook page for it, called Crooked Lines, A Novel. If you like it, “like” it! Please. If you’re an author, do you have a Book Page for each book? William Sirls: Penitentiary Pennings Lead to Christ and a Movie Deal. Here’s the official book trailer! So Much News! So Much FUN! INDIA’S CROWN’S (India’s Crown in Christian Literature Excellence) objective is to join Christian American authors with Christian readers from India. The premier resource for Christian Fiction across India, India’s Crown in Christian Literature Excellence (ICICLE), offers book reviews, author interviews, and free giveaways. It provides the opportunity for discriminating readers to not only read the best in Christian Fiction/clean reads, but also to chat with the authors they love to read, with Christ being the common denominator. We will have a new post each week to introduce Christian or “clean” reads to this fast growing market of Christian readers in India. I will continue to blog here on http://www.writingstraight.com as regular as possible. Thanks for supporting Caryl and me in this endeavor. And while you’re at http://www.indiascrown.com, please like our facebook page and connect with us on twitter. PS: CROOKED LINES, my first novel, is going to be released in about thirty days!!!!! More news to come! VOW UNBROKEN, A Texas Romance.